Just yesterday, my sisters and I went to visit our friend's wonderful home in Kemang which looks like homey wonderland and just like everybody else, when the place is so beautiful like this, we won't waste the chance to go home without taking some snaps here and there ahahaha. Anyway, thank you so much Mrs. Josephine Widira for letting us barge in your wonderland and take pictures like there's no tomorrow *super big hug*. 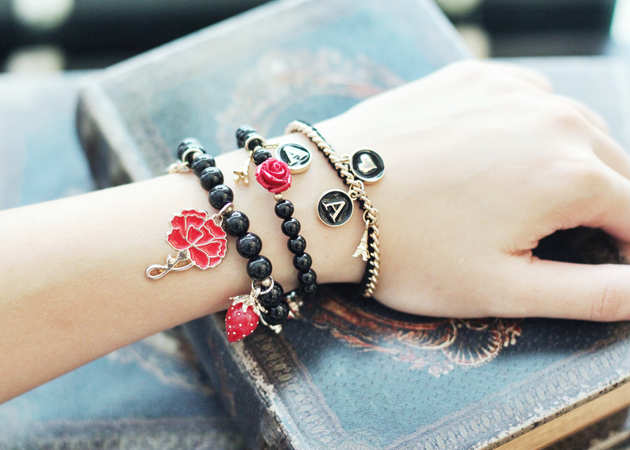 Some new bracelets from my love Hanaru Park. Matched it with crop top from SisSae, bianca pumps from Christian Louboutin and some adorable bracelets from Hanaru Park. Photos by my lil sister, Dewi. great place to take photos indeed <3<3 and love your tulle skirt and white crop top! super love your tutu skirt! You look like such a princess! I love your tulle skirt and the pale pastel colors! I like the skirt, it's so pouffy but light as well. You look like Alice in Wonderland with that amazing tulle skirt and dreamy background! It is so beautiful,pretty girl and great style! Ive been eyeing this tulle skirt for a week and im still looking a perfect color..